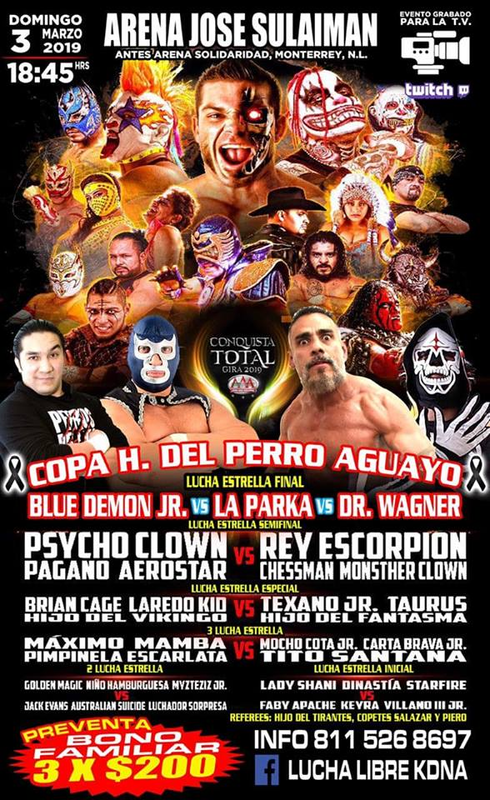 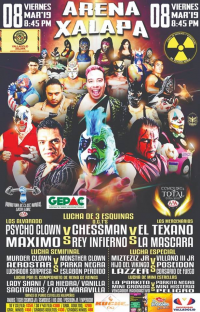 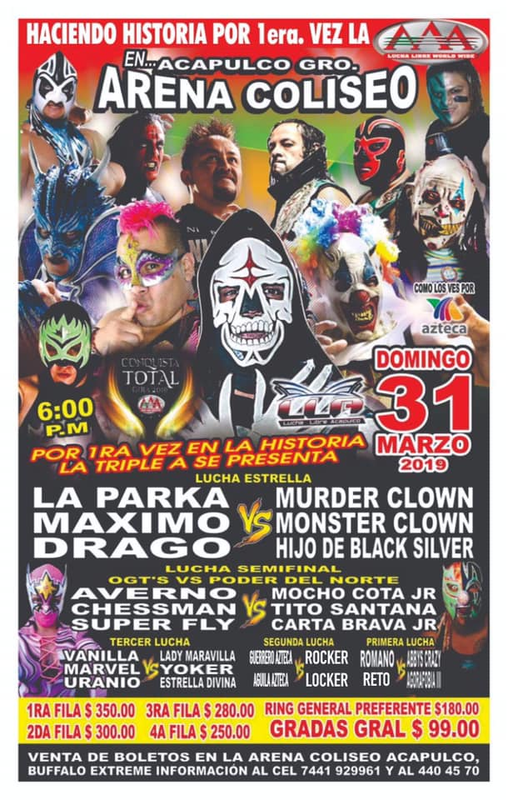 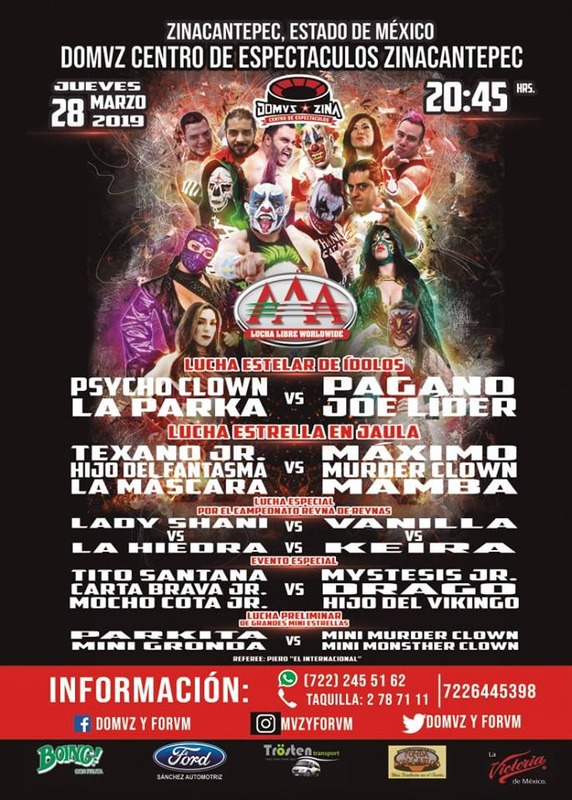 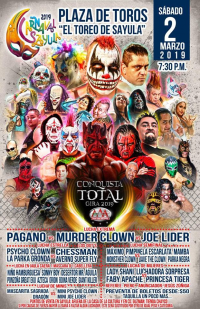 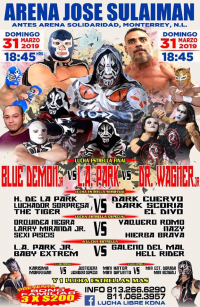 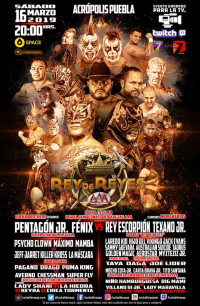 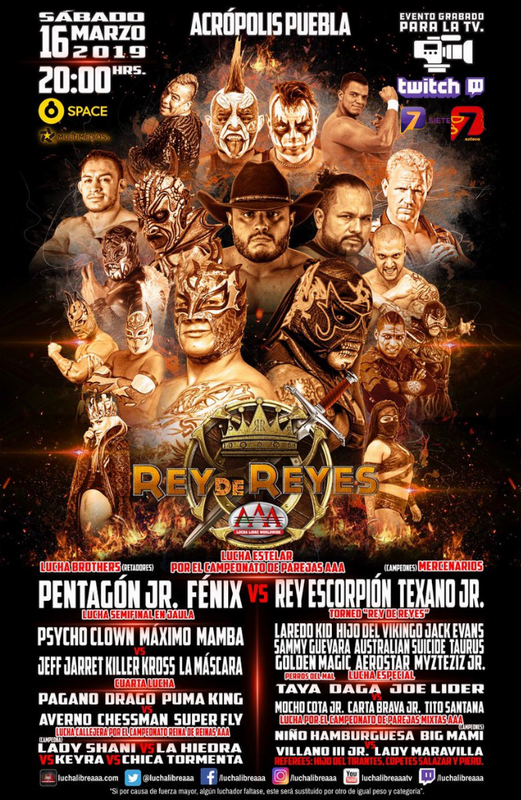 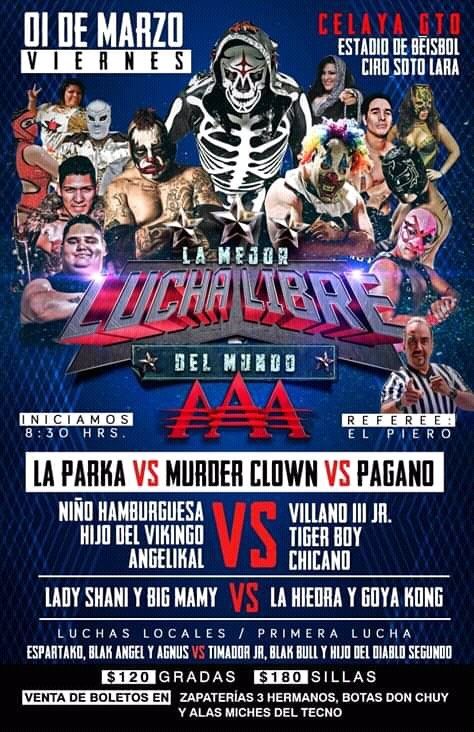 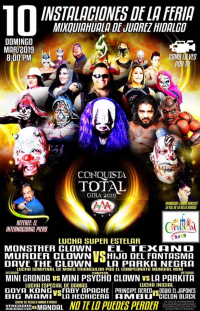 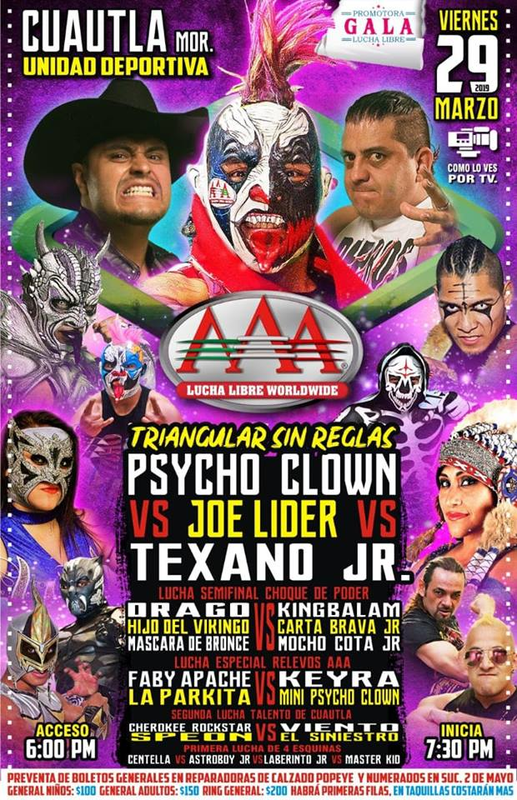 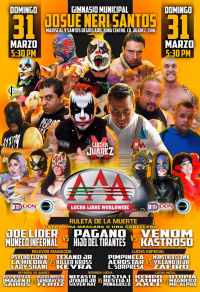 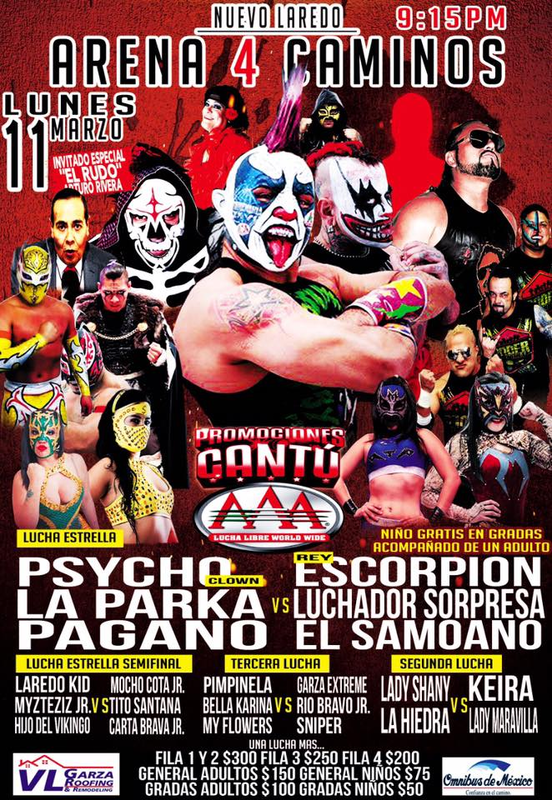 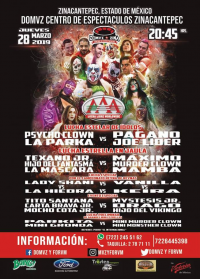 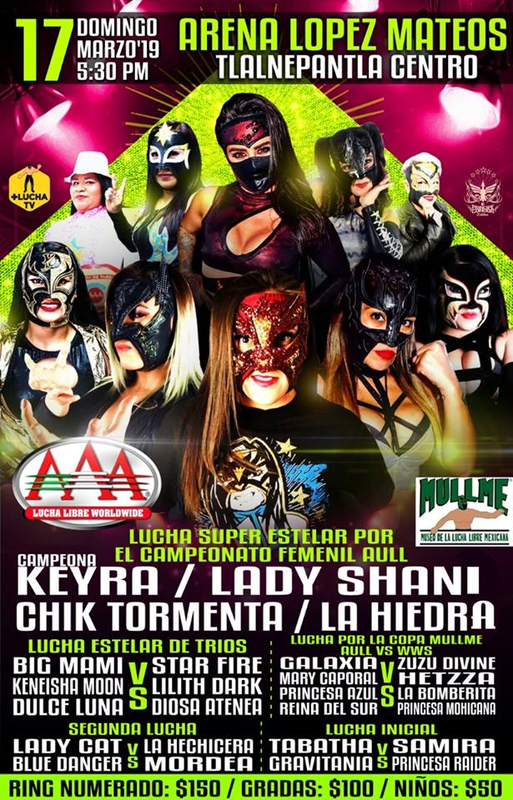 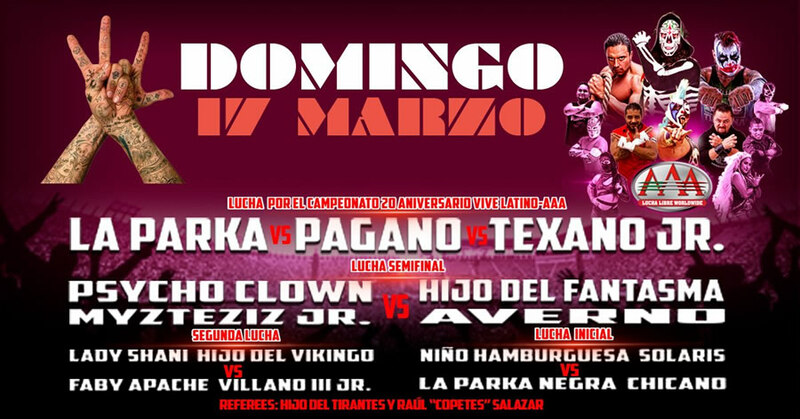 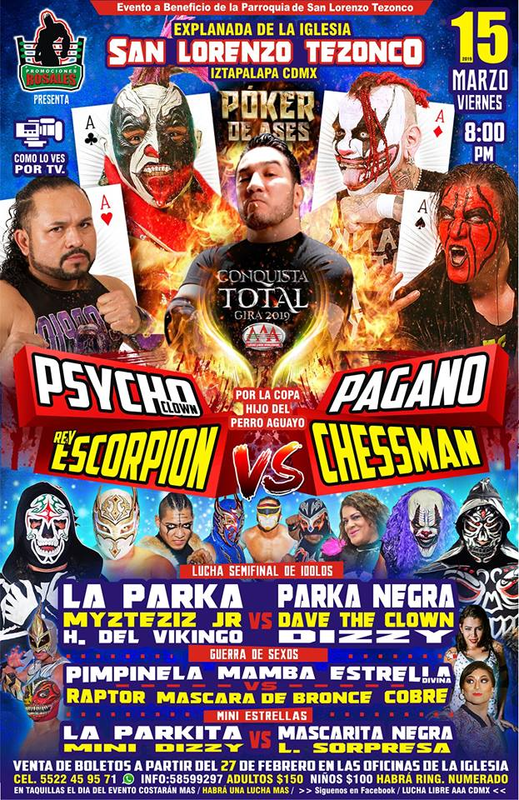 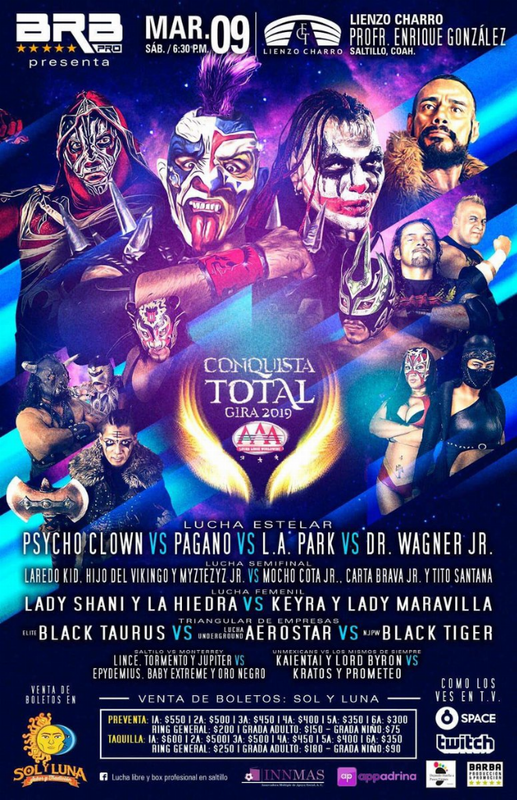 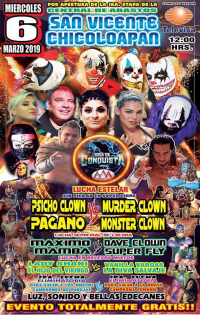 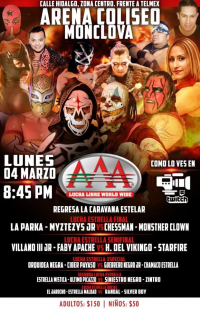 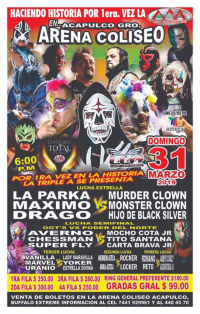 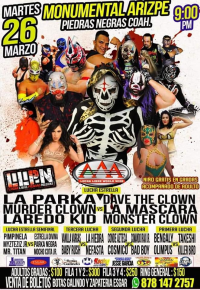 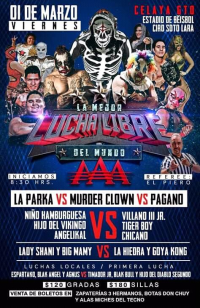 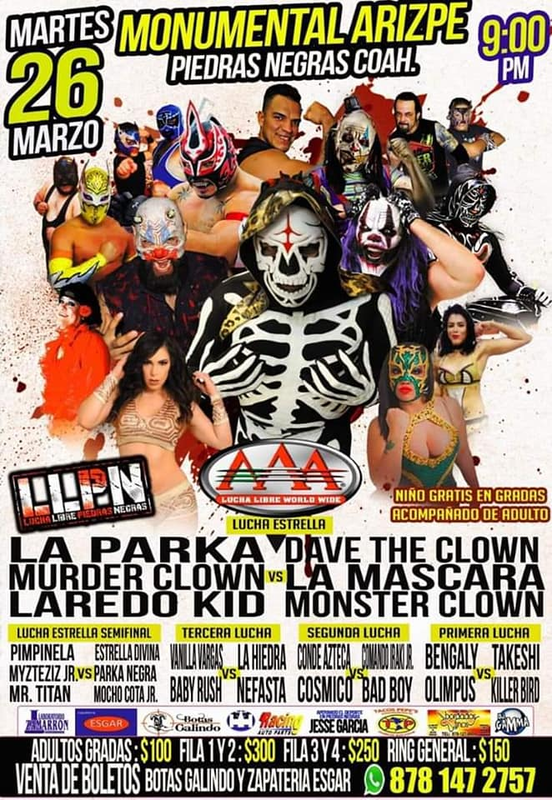 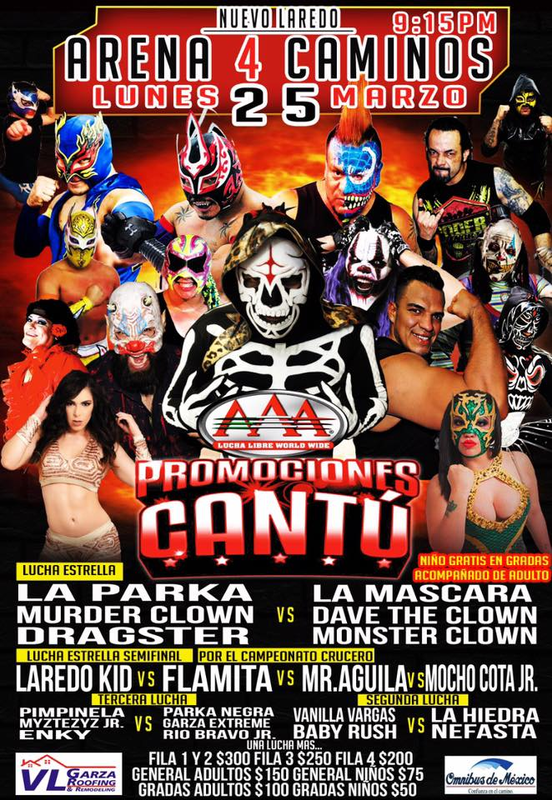 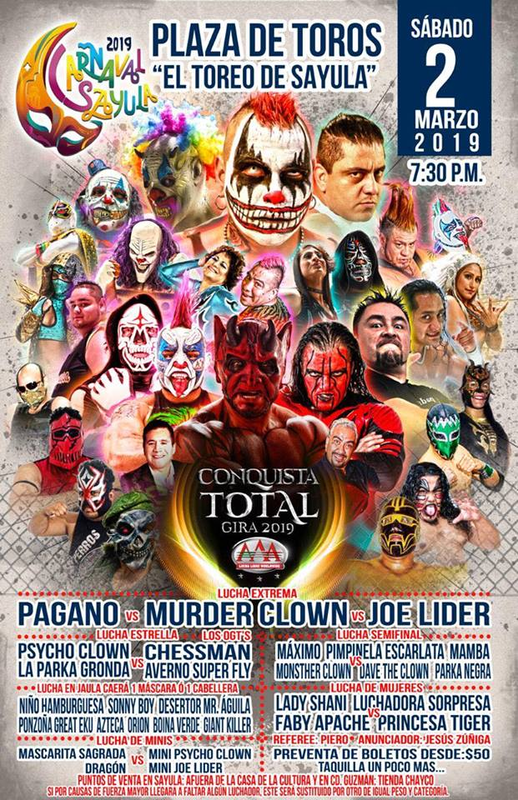 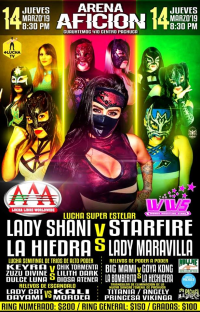 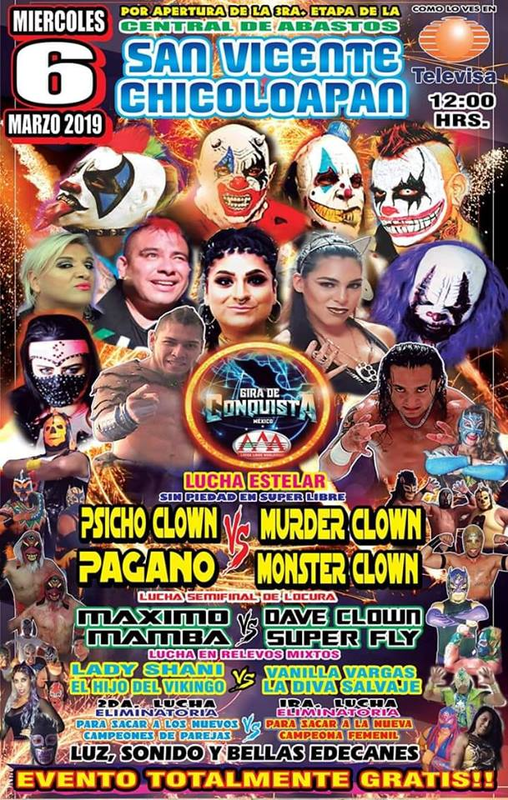 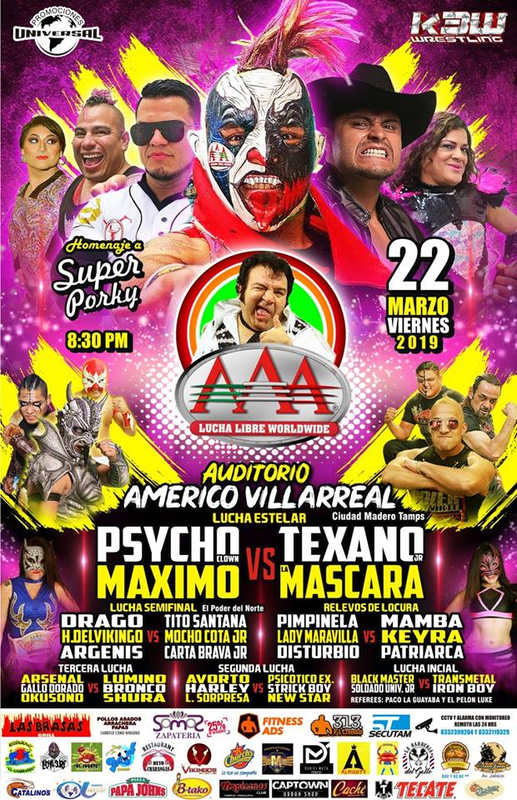 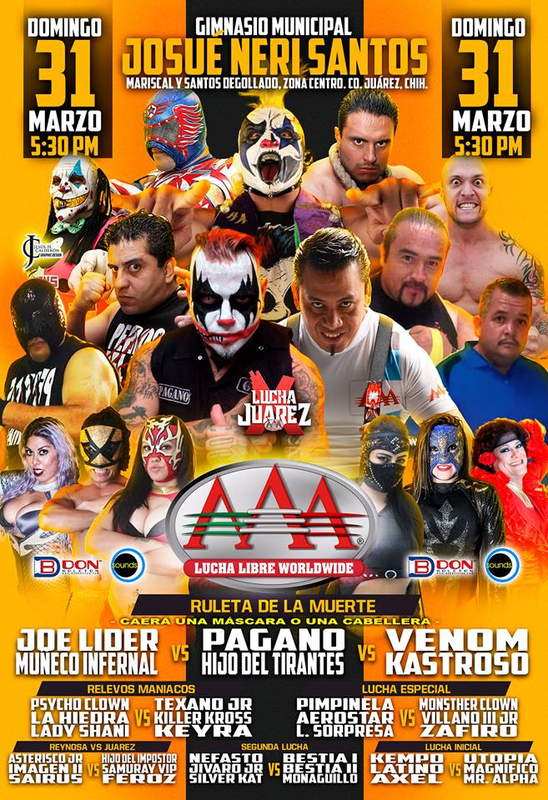 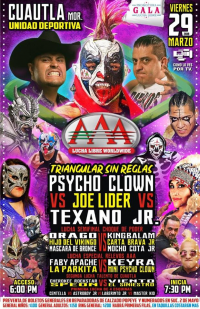 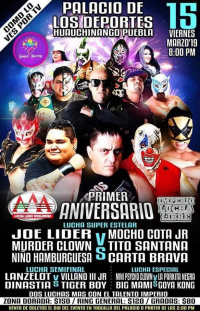 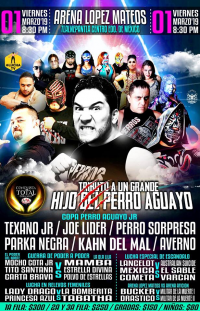 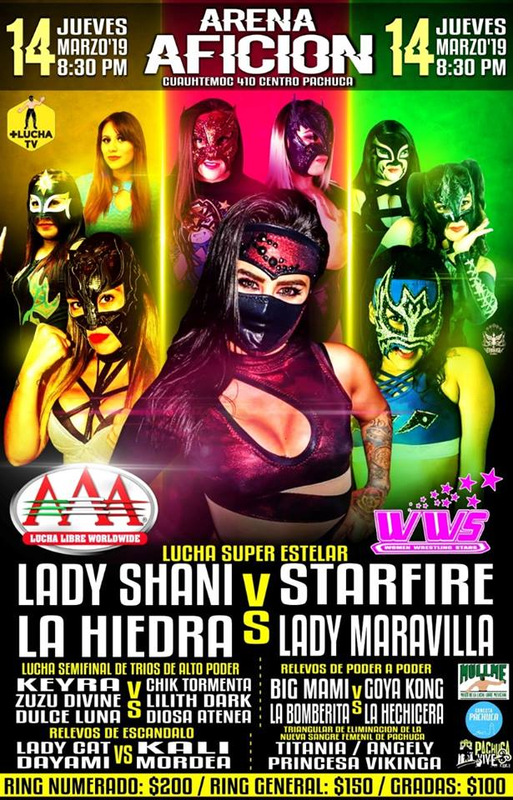 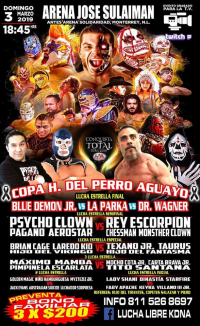 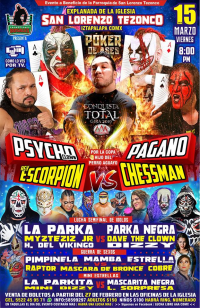 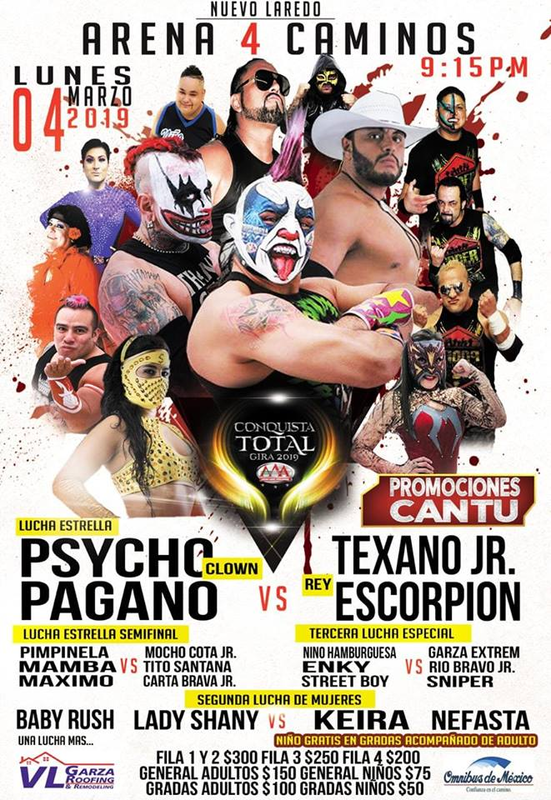 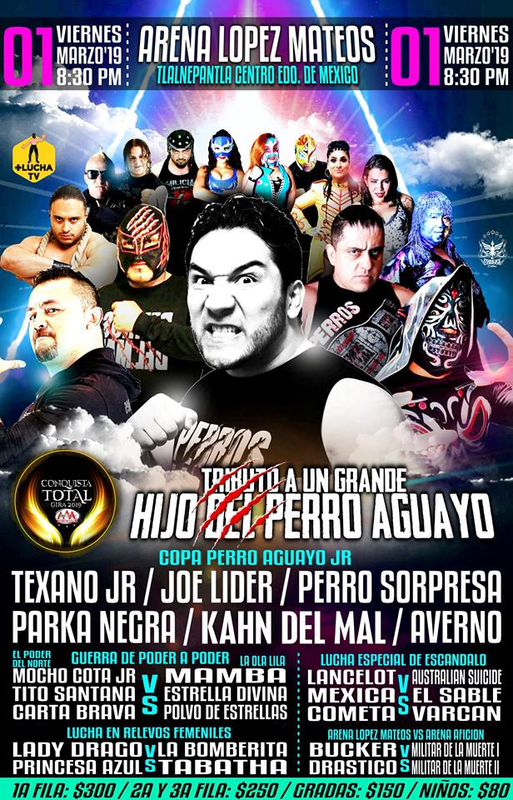 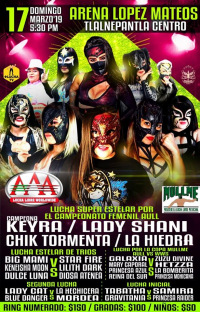 6) Carta Brava Jr., Mocho Cota Jr., Tito Santana b Hijo Del Vikingo, Laredo Kid, Myzteziz Jr.
8) Psycho Clown b Pagano, LA Park, Dr. Wagner Jr.
4) Hijo Del Vikingo & Lanzelot vs Tiger Boy & Villano III Jr.
2) Dinastía & Lanzelot vs Tiger Boy & Villano III Jr.
6) Máximo & Psycho Clown vs La Máscara & Texano Jr.
3) Enky, Myzteziz Jr., Pimpinela Escarlata vs Garza Xtreme, Parka Negra, Rio Bravo Jr.
2) Conde Azteca & Cósmico vs Bad Boy & Comando Iraki Jr.
Rey Escorpion replaced Hijo del Fantasma. 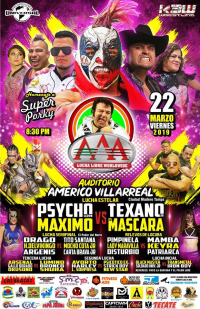 Maximo and Mascara are still doign hair matches. 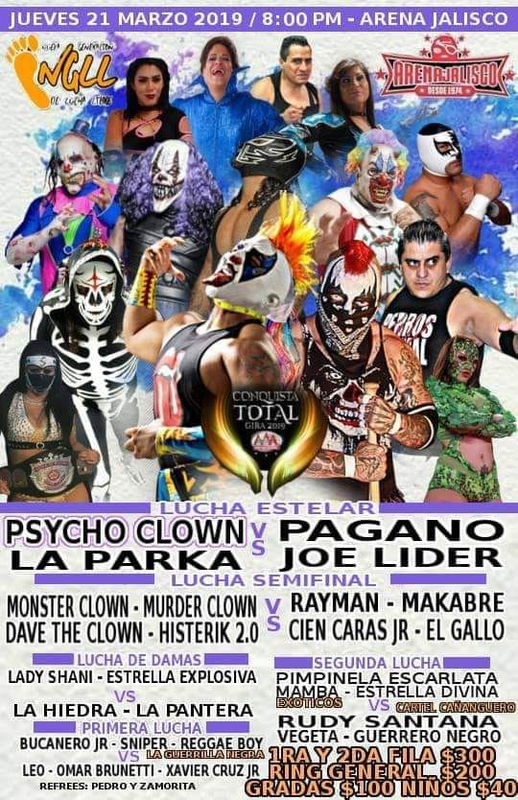 4) Drago, Hijo Del Vikingo, Máscara de Bronce vs Carta Brava Jr., King Balam, Mocho Cota Jr.
5) Psycho Clown vs Joe Lider, Texano Jr. 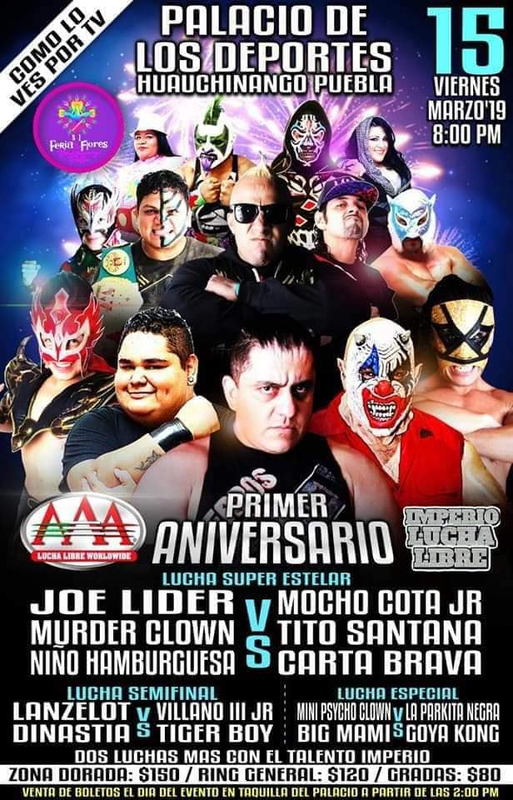 Event Notes: billed as the first AAA (spot) show in Arena Coliseo Acapulco, which had been a CMLL and UWA building. 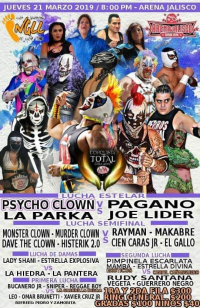 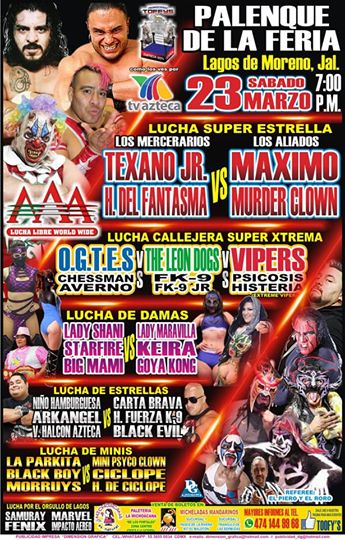 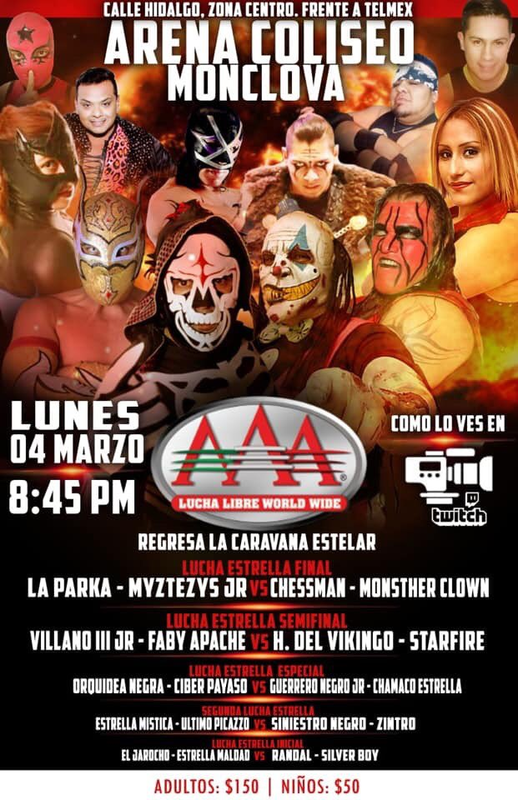 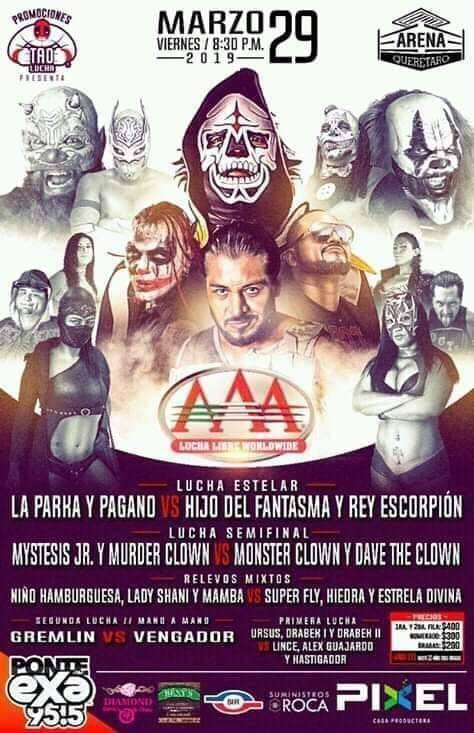 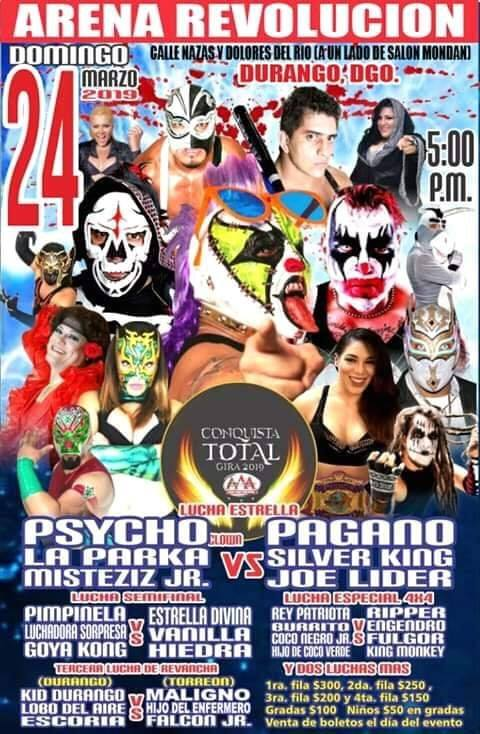 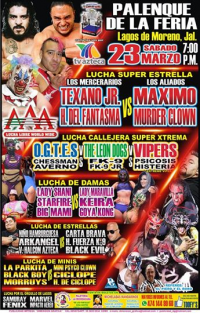 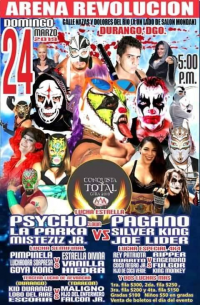 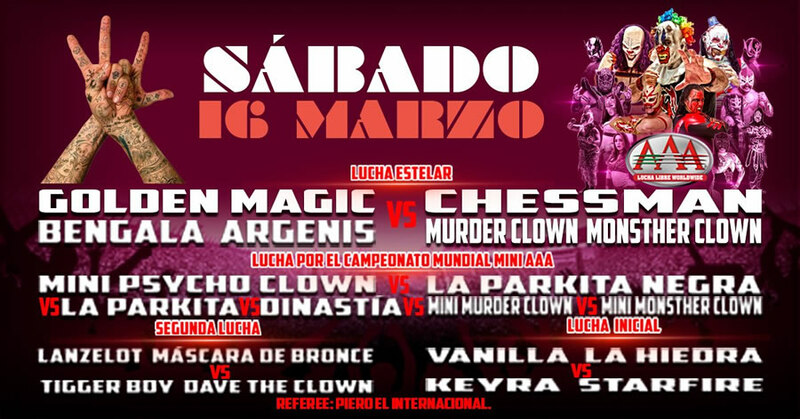 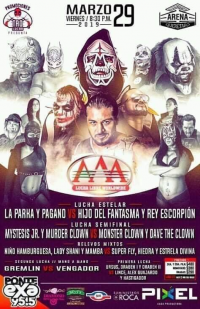 5) La Hiedra, Lady Shani, Psycho Clown vs Hijo del Fantasma, Keira, Texano Jr.